Not to be confused with Bhutan or Batuan, Bohol. From top, left to right: Aerial view of urban Butuan, Macapagal Bridge, View of Downtown Butuan City, Father Saturnino Urios University swimming pool, and the Guingona Park. Butuan (pronounced /buːˈtwɑːn/), officially the City of Butuan (Cebuano: Dakbayan sa Butuan; Butuanon: Dakbayan hong Butuan), or simply known as Butuan City, is a 1st class highly urbanized city and regional center of the Caraga Region, Philippines. According to the 2015 census, it has a population of 337,063 people. It served as the former capital of the Rajahnate of Butuan before 1001 until 1756. The city used to be known during that time as the best in gold and boat manufacturing in the entire Philippine archipelago, having traded with as far as Champa, Ming, Srivijaya, Majapahit, and the Bengali coasts. It is located at the northeastern part of the Agusan Valley, Mindanao, sprawling across the Agusan River. It is bounded to the north, west and south by Agusan del Norte, to the east by Agusan del Sur and to the northwest by Butuan Bay. Butuan City was the capital of the province of Agusan del Norte until 2000, when Republic Act 8811 transferred the capital to Cabadbaran City. For statistical and geographical purposes, Butuan City is grouped with Agusan del Norte but governed administratively independent from the province while legislatively administered by the province's 1st congressional district. The name "Butuan" is believed to have originated from the sour fruit locally called batuan. Other etymological sources say that it comes from a certain Datu Buntuan, a chieftain who once ruled over areas of the present-day city. According to Datu Makalipay, Butuan was named after the wife of Datu Balansag who was the tiniente de barangay of the area before. The Butuan Ivory Seal, housed and displayed at the National Museum of the Philippines. Butuan, during the pre-colonial times, was known as the Rajahnate of Butuan, an Indianized kingdom known for its metallurgic industry and sophisticated naval technology. The rajahnate flourished at the 10th and 11th centuries CE, and had an extensive trade network with the Champa civilisation and the Srivijaya Empire. By 1001, the rajahnate had established contact with the Song dynasty of China. The History of Song recorded the appearance of a Butuan mission at the Chinese imperial court, and the rajahnate was described as a small Hindu country with a Buddhist monarchy, which had a regular trade connection with Champa. The mission, under a Rajah named "Kiling", asked for equal status in court protocol with the Champa envoy, but ultimately was denied by the imperial court. However, under the reign of Sri Bata Shaja, the diplomatic equality was eventually granted to the kingdom, and as a result the diplomatic relations of the two nations reached its peak in the Yuan dynasty. Evidence of these trading links are in the discovery of 11 balangay boats around Ambangan in Barangay Libertad, which was described as the only concentration of archaeological, ancient, ocean-going boats in Southeast Asia. Other evidences of the post are the discovery of a village in Libertad that specializes in gold, deformed skulls similar to reports in Sulawesi, and the discovery of many artifacts by locals and treasure hunters. On March 31, 1521, an Easter Sunday, Ferdinand Magellan ordered a mass to be celebrated. This was officiated by Friar Pedro Valderrama, the Andalusian chaplain of the fleet, the only priest then. Another priest, the French Bernard Calmette (Bernardo Calmeta) had been marooned at Patagonia with Juan de Cartagena for being implicated in the mutiny at Puerto San Julián. Conducted near the shores of the island, the Holy First Mass marked the birth of Roman Catholicism in the Philippines. Rajah Colambu and Siaiu were said to be among the first natives of the soon-to-be Spanish colony to attend the mass among other Mazaua inhabitants, together with visitors from Butuan who came with the entourage of Colambu, king of Butuan. Controversy has been generated regarding the holding of the first mass—whether it was held in Limasawa, Leyte in Masao, Butuan City, in the hidden isle made up of barangays Pinamanculan and Bancasi inside Butuan, in the latest discovered site in between Agusan del Sur and Surigao del Sur, the small barangay of Barobo, or elsewhere. It is sure, however, that Ferdinand Magellan did not drop anchor by the mouth of Agusan River in 1521 and hold mass to commemorate the event which was held at Mazaua, an island separate from 1521 Butuan which, in the geographical conception of Europeans who wrote about it, was a larger entity than what it is now. Antonio Pigafetta who wrote an eyewitness account of Magellan's voyage described in text and in map a Butuan that stretched from today's Surigao up to the top edge of Zamboanga del Norte. The first municipal election in Butuan took place in March 1902 in accordance with Public Law No. 82 which coincided with the American occupation of the place. During the Japanese occupation of the Philippines in World War II, more than half of Butuan, if not all of it, was burned when local guerrilla forces attacked the enemy garrison on 12 March 1943 in the Battle of Butuan. :318:7 On January 17, 1945, guerrillas attacked Japanese troops on the road between Cabadbaran and Butuan to prevent the Japanese garrison at Butuan from being reinforced. When the guerrillas depleted their ammunition supply, they were forced to retreat. Later in 1945, the Philippine Commonwealth troops in Butuan together with the recognized guerrillas attacked the Japanese forces during the Battle of Agusan. On October 20, 1948, still recovering from the war, the entire municipality was ruined by a fire. By the late 1940s to the 1970s, Butuan's industry specialized in timber, earning it the nickname "Timber City of the South". The plentiful trees of the area invited many investors to the city, and inspired then-Congressman Marcos M. Calo to file a bill elevating Butuan for cityhood. On August 2, 1950, this was passed, converting Butuan into a city. However, by the early 1980s, the logging industry of the city began to decline, although the city was still an economic haven to many investors. The city's main income by that time frame and until this day depended on small and medium business, and large-scale projects by investors. On February 7, 1995, the city was reclassified from a chartered city to a Highly Urbanized city. sixteen days later, on February 23, the region of Caraga was created by virtue of Republic Act 7901, with Butuan as its regional center, and the provincial capital of Agusan del Norte. In 2000, Republic Act 8811 formally transferred the capital of Agusan del Norte from Butuan to Cabadbaran, however most provincial offices are still located in the city. Butuan City has a land area of 81,662 hectares (201,790 acres), which is roughly 4.1% of the total area of the Caraga region. The existing land use of the city consists of the following uses: agriculture areas (397.23 km2), forestland (268 km2), grass/shrub/pasture land (61.14 km2) and other uses (90.242 km2). Of the total forestland, 105 km2 is production forest areas while 167.5 km2 is protection forest areas. The city is endowed with swamplands near its coastal area. These swamp areas are interconnected with the waterways joined by the Agusan River. Most of the swamplands are actually mangroves that served as habitat to different marine species. Filling material needs of the city are extracted usually from the riverbank of Taguibo River. Others are sourced out from promontories with special features and for special purpose. The fishing ground of Butuan is the Butuan Bay of which two coastal barangays are located. It extends some two kilometers to the sea and joins the Bohol Sea. These are the barangays of Lumbocan and Masao. Butuan has a tropical rainforest climate (Köppen climate classification Af). Butuan is subdivided into 86 barangays and group into 13 districts. Also, barangays 1 thru 26 form the Poblacion (city proper) of Butuan City. With a total population of 337,063 in the 2015 census, it has an average density of 413 persons per km2, higher than the regional average density of 120 persons per km2. Butuan City is the commercial, industrial, and administrative center of Caraga region. It is a strategic trading hub in Northern Mindanao with major roads connecting it to other main cities in the island such as Davao, Cagayan de Oro, Malaybalay, Surigao, and soon, Tandag. It hosts one of the busiest airports in the country, the Bancasi Domestic Airport, serving around 525,000 passengers in 2012. Cebu Pacific and Philippine Airlines are flying to and from Butuan City. Meanwhile, the nearby Nasipit International Port and in-city Masao Port are providing for its shipping and cargo needs. The total number of businesses registered in 2013 was 9,619—reflecting a growth of 9.86% and almost 3 times that of the next major Caraga city. New businesses registered numbered 2,032 with a combined capitalization of P504,598,667, an expansion of 75.63 from 2012. As further proof of its dynamic economy, Butuan City's local income reached P330,510,000 in 2013 besting other major cities in the country. By 2014, its local income is expected to reach P513,870,000.00 or register a growth of 55%; and total income (including IRA) will be P1,515,970,000. Butuan City was ranked 4th and 16th Most Competitive City for the years 2012 and 2014 by the National Competitiveness Council of the Philippines. More than 260 financial institutions are operating in the city such as Metropolitan Bank and Trust Company (Metrobank), Banco de Oro, Bank of the Philippine Islands (BPI), Land Bank of the Philippines (Landbank), Philippine National Bank (PNB), Chinabank, EastWest Bank, Rizal Commercial Banking Corporation (RCBC), Union Bank of the Philippines (UnionBank), Security Bank and Maybank. Rural banks are also expanding aggressively. Based on a report from PDIC (as of December 2013), total savings deposit in Butuan City amounted to P18,944,854,000, comprising 45% of the total deposits in Caraga Region. The Bangko Sentral ng Pilipinas (BSP) opened its regional office here to take advantage of the vibrant gold trading industry in the region. Insurance companies, led by Philam Life, are also present in the city. The city's major agricultural produce are rice, bananas, coconuts, poultry, shrimp, and milkfish. Its key industries include rice milling, food processing, wood processing, furniture, fuel distribution, shipbuilding, and construction. The manufacturing sector will soon get a boost as an industrial park is currently being developed. Butuan has also proven to be a haven for renewable energy with investments in solar and hydroelectric power generation pouring in the city. Butuan is also fast-becoming a cosmopolitan city. Currently, there are three (3) major commercial centers catering its populace. These are Robinsons Place Butuan, Puregold Price Club (both opened in 2013), and Gaisano (Unipace). Leading mall developer, SM, is expected to break ground by the end of 2016, although some of the mall developers in the Philippines have also expressed their interest in the city such as Gaisano Capital to name a few. 7-Eleven opened its first two stores in the city. High-end real estate developers, such as Filinvest and Vista Land, have started their residential projects in the city. The A. Brown Group is also developing another exclusive community with a 9-hole golf course. More low- and medium-cost housing projects are sprouting in the outskirts of the city evident of the city's strong market for shelter. Famous food brands have also opened shops in the city such as Jolibee, McDonald's, Chowking, Greenwich, Mang Inasal, Red Ribbon, Goldilocks, Pizza Hut, Gerry's Grill, Max's and Bo's Coffee. KFC has finally opened since December 2016. As for the telecommunications infrastructure of the city, Smart Communications, Globe Telecom, PLDT and Bayantel are able to serve its ever-growing needs. Butuan City is becoming one of the highlights of the tourism programs in the Philippines, as more and more people, both local and foreign, are discovering the wonders and secrets of this ancient and beautiful city. It is customary for any traveler to learn a little bit of history concerning the place that will be visited, and the history of Butuan City is one of the most fascinating. Unlike other lands whose development only began during the Spanish colonization, Butuan was already a progressive and full fledge city centuries before the arrival of the Spaniards. Historical records show that as early as the 10th century, the local people were already engaged in trade and commerce with other nations and cultures, like the Champa (now Vietnam) and the Srivajaya peoples of Java, Indonesia. This is confirmed by the unearthing of several artifacts such as boats used for plying their trade. During the Spanish and American occupation, Butuan continued to make progress and the number of people who were settling increased steadily. A large number of its inhabitants were converted to Christianity, and in fact one of the issues is whether the first mass was actually held in the city. The Kahimunan Festival is celebrated every third Sunday of January in celebration of the city patron Sr. Sto. Niño. This celebration is a Butuanon version of Sinulog of Cebu City. Kahimunan is a Lumad term which means "gathering". Butuan celebrates its annual fiesta, the Balangay Festival, for the celebration of the city patron Saint Joseph every whole month of May, with the exact feast day of St. Joseph on May 19. The city holds many events such as summer league basketball championship games, thanksgiving mass, and more. Butwaan Festival: The newest festival is a feast day celebration of St. Joseph, patron of Butuan, which is held every May 19. This was created last 2013 as replacement to Balangay Festival during the specific date. Both festivals will still celebrates the feast of St. Joseph with Butwaan focus on the Church activities while Balangay will focus on the city government activities. The Cultural festival/tourism consciousness is a week-long celebration that lasts from the last week of July up to August 2 in celebration of the Charter Day of Butuan. Abayan Festival: The Abayan Festival, a part of the Cultural Festival, is held in celebration of St. Anne, patroness of Agusan River, which is celebrated every last Sunday of July. Palagsing Festival: "Palagsing" is a local delicacy popularly made in Banza, one of the old poblacion of Butuan City. The popularity of making Palagsing in Banza is attributed to the abundance of Lumbiya (Metroxylon sagu Rottb.) where Unaw or lumbiya starch is harvested from the palm tree. Another popular ingredient is young coconut meat. The mixture of unaw, young coconut and brown sugar make palagsing moist and chewy. They are delicately wrapped by banana leaves and are boiled for 30 minutes to create the soft consistency of palagsing. The Palagsing Festival usually held on Adlaw Hong Butuan Celebration every 2nd day of August. Adlaw Hong Butuan: Adlaw Hong Butuan is the charter day celebration of Butuan, which includes a thanksgiving mass, motorcade, palagsing festival, street party recognitions of outstanding Butuanons and City Government Employees' Night. Unaw Festival: The Unaw Festival is usually held on Adlaw Hong Baan Tres Celebration every 3rd or 4th Week of June. Agusan River: The Agusan River is the widest and most navigable river in Mindanao. Natives who live on the banks of this river pay tribute to their patroness, Senora Sta. Ana (Saint Anne) every last Sunday of July in the Abayan festival. Mount Mayapay: Looming southwest of the Agusan Valley is this majestic mountain plateau. It rises to 2,214 feet (675 m) above sea level. Mount Mayapay got its name from the ancient Madjapahit Empire. The history behind the Sri-Vishaya period bears much meaning and influence of Butuan's pre-historic and archaeological discoveries. Ramon Magsaysay Bridge: The old Magsaysay Bridge in Butuan, an arched-type steel bridge built during the early sixties spans the mighty Agusan River. For years this bridge serve as a lone vital conduit of the city to the rest of Mindanao island until its new more modern pair came at the city’s southern side. The bridge links the main urban center to eastern suburbs of Baan and Ampayon. Balangay Boats: The Balangays (or Balanghai) are ancient boats that were found in Butuan. They were excavated in the Balangay Shrine, across the Masao River from Bood Promontory. They played a major role in Butuan because Butuan was, and still is, a port city. Since its discovery, the Balangays have become an icon of Butuan. The Kaya ng Pinoy, Inc. recreated the Balangay boats and have sailed it as part of their project, the Balangay Voyage. So far they have only sailed around Southeast Asia. They are planning to sail around the world. Balangay Shrine Museum: The Balangay Shrine Museum, located in Brgy. Libertad, lays the graveyard of the Balangay 1 dated 320 A.D. or 1688 years old. The Balangay shrine museum is located at Balanghai, Libertad, Butuan City. This wooden plank-build and edge-pegged boats measured an average of 15 meters in length and 3 meters wide across the beam. To date, 9 Balangays have already been discovered in Ambangan, Libertad. Three have been excavated and others are still in Site. National Museum (Butuan City Branch): This museum is the repository of historical and cultural materials and artifacts that proves Butuan's prehistoric existence and rich cultural heritage. There are two exhibit galleries. The Archaeological Hall and Ethnological Hall specimens of stone crafts, metal crafts, woodcrafts, potteries, goldsmith, burial coffins, and other archaeological diggings are exhibited. At the Ethnological Hall are exhibits of contemporary cultural materials the Butuanon or every Filipino for matter used for a living. Guingona Park: Guingona Park is the native name for that park. Changes of government, however, resulted in a change of name to Rizal Park. It was contended that Rizal went there and that they named the park after him. Recently, the government of Butuan City headed by Mayor Amante reconstructed the park and put the name back to Guingona, as it was he who donated the said park some decades past. Delta Discovery Park: Delta Discovery Park is a newly opened zip-line in Butuan. Delta Discovery Park is at Brgy. Bonbon, Butuan City. A hidden paradise in the heart of the city, it is also known as the longest zip-line in Mindanao and in Asia with a length of 1.3 kilometers. Bood Promontory Eco Park: This historic hill is believed to have been the site where Magellan and his men celebrated the first Catholic Mass on Philippine soil and erected a cross when he landed in Mazaua on March 31, 1521. The highest elevation nearest the seaside village of present-day Masao, Bood is a wooded area at a bend in the Masao River (El Rio de Butuan), overlooking Butuan Bay and ancient Butuan as well as the serpentine Masao River. Today, the indigenous Hadlayati tree abound, lording over a clonal nursery and tree park, amidst fishponds and archaeological treasures. According to the chronicles of Spanish historian Pigafetta, the event took place in the afternoon of March 31, 1521 after the Easter Mass was celebrated in the morning of the same date. Two Butuanon brother kings attended these Easter ceremonies. Pigafetta also noted the surrounding fields and balanghai boats on the bay that could be seen from the hill. The eco-park was established to provide the people of Butuan and its visitors a place to rekindle the past amidst a relaxing natural setting. The local government of Butuan City is headed by an elected Mayor and is considered to be the local chief executive of the city. He exercises the general supervision and control over all programs, projects, services, and activities of the city government. He is then accompanied by the law making body of the city which is called, The Sangguniang Panlungsod headed by the elected Vice Mayor as the presiding officer, together with ten (10) elected Sangguniang Panlungsod Members and the President of the Liga ng mga Barangay as an ex-officio member. Note: Due to the postponement of Sangguniang Kabataan (SK) Elections in 2013, there was no set of SK Chairperson for each barangay. Hence, there was no election of officers for the Sangguniang Kabataan Federation Butuan City Chapter. The positions, thus, will remain vacant until SK Elections will be held again. The newly renovated Urios Gym (Left) and Saint Joseph Institute of Technology at night (Right). Being the regional center of Caraga, Butuan is also the region's center of education. There are two universities in the city. The first, Father Saturnino Urios University, a privately run school founded by Rev. Fr. Urios, S.J. in 1901. The second, the Caraga State University—Main Campus, formerly known as the Northern Mindanao State Institute of Science and Technology, is a state-run school founded in 1918. They are among the top two performing universities in the region. Butuan City is known for its education competence. Proof of these are in awards earned. Teachers and school staff of the Butuan Central Elementary School, Butuan City SPED Center and Agusan National High School have large-scale exposure to specialization techniques, as well as seminars and workshops to complement, with partnerships like Philippine-Australia Project on Basic Education (PROBE). There are also Chinese schools in the city like the Timber City Academy and Butuan Faith Christian School. National high schools include the Agusan NHS, Tungao NHS, San Vicente NHS, Libertad NHS and Ampayon ISS (Integrated Secondary School). The city is also home of the Butuan City School of Arts and Trades (BCSAT), a specialization school in the fields of arts and in vocational courses. As an education hub, Butuan has colleges with a variety of courses. Examples are the Agusan College, Inc., AMA Computer Learning Center (ACLC), Butuan Doctors College, Saint Joseph Institute of Technology, Agusan Business and Arts Foundation, Agusan Institute of Technology, Asian College Foundation, Balite Institute of Technology—Butuan, Butuan City Colleges, Butuan City Liga College, Corjesu Computer College, Elisa R. Ochoa Memorial Northern Mindanao School of Midwifery, Father Urios Institute of Technology of Ampayon, Inc., Grand View College, Holy Child Colleges of Butuan City, Philippine Electronics and Communication Institute of Technology, Saint Peter College Seminary, and the Sunrise Christian College Foundation of the Philippines. Big private universities like the Ateneo, De La Salle Philippines and Iglesia Ni Cristo-owned New Era University (NEU) have expressed to put up local branches. Other schools include Enfant Cheri Study Centre, Rainbow of Angels Learning Center, Solid Rock Shilo Mission Academy, Ampayon Central Elementary School, Angelicum Montessori School, Butuan Grace Christian School, Butuan Christian Community School, Florencio R. Sibayan Central Elementary School, Libertad Central Elementary School, Obrero Elementary School, and the Ong Yiu Central Elementary School. The Butuan National Airport, called Bancasi Airport, serves the general area of Butuan City, located in the province of Agusan del Norte in the Philippines. It is the only airport in the province and largest in the Caraga region. The airport is classified as a trunkline airport, or a major commercial airport, by the Air Transportation Office, a body of the Department of Transportation and Communications that is responsible for the operations of not only this airport but also of all other airports in the Philippines except the major international airports. It also serves more than 400,000 travelers yearly that includes 250,000 local and foreign tourists. Butuan National Airport can also accommodate 5 to 10 flights a day including large number of aircraft via Cebu Pacific and Philippine Airlines operated by PAL Express. As a regional commercial and economic hub, the Port of Masao is Butuan's seaport. It was built to avoid having the city depend on the port of Nasipit, Agusan del Norte. The said port will be having more expansion and development to become a seaport with international standards in the region and in Mindanao. The main modes of transportation within the city proper is the "orange" tricycle which can accommodate up to 6 or 7 passengers. Another mode of transportation is the small-type jeepneys or multicab vehicles with a seating capacity of at least 15 passengers via fixed routes going to big barangays such as Bancasi, Libertad, Ampayon, Los Angeles and De Oro. Jeepneys, Vans and Buses is also available in Jeepney Terminal, New Integrated Van Terminal and City Integrated Bus Terminal respectively located Langihan Public Area. They also follow fixed routes to outlying barangays, neighboring towns, municipals, cities and provinces. Long distance routes also include cities of Manila, Ormoc, Legazpi, Tacloban, Surigao, Tandag, Bislig (Mangagoy), Davao City, Tagum, Cagayan de Oro, Carmen, Balingoan, Gingoog and Malaybalay. The said circumferential is a 14 kilometer diversion road from Brgy. Bancasi to the southern part of the city proper crossing to a PP2.1 Billion Diosdado Macapagal Bridge to the main highway in Baan Km.3 and in Brgy. Antongalon. The Diosdado Macapagal Bridge is the longest bridge in Mindanao, which is .3 kilometers upstream of the old Magsaysay Bridge and provides an alternate route across the Agusan River to connect the Philippine-Japan Friendship Highway (Surigao-Agusan-Davao road) and the Butuan City-Cagayan-Iligan road. The bridge is gaining popularity as the only cable stayed bridge with steel deck and single tower in Mindanao, and it has a total length of about .806 kilometers. It was during the Presidency of Joseph Estrada that the project was approved which was lobbied by the city government way back President Fidel Ramos' time to decongest the traffic of the more than 50-year-old Magsaysay Bridge and create an alternate route. However, it was President Gloria Macapagal Arroyo who approved and implemented the project. The bridge was funded through a Special Yen Loan Package from Japan Bank for International Cooperation (JBIC). The project was started on May 6, 2004 and completed in May 2007. The new circumferential road consists of 20 kilometer 2-lane road and four (4) new bridges that connects Brgy. Sumilihon to Brgy Banza which crosses 2 small rivers (Taguibo and Banza) before crossing to the Third Bridge in Agusan River and connects to Brgy. Pagatpatan to Brgy. Lumbocan then crosses again in Masao River to reach Brgy. Masao and Brgy. Pinamanculan before connecting to the National Highway in Brgy. Bancasi. The proposed circumferential road will be worth closed to PP2.9 Billion. The secondary road, known as the Butuan City-Malaybalay Road, is scheduled to complete in the future connecting Butuan to Malaybalay via Esperanza, Agusan del Sur. Photo montage of the Butuan Polysports Complex (top left to right: Logo of the Butuan Polysports Complex, Polysports Baseball Park, Polysports Basketball Gymnasium, and Polysports Football Stadium). With new developments surrounding the old unfinished sports complex facility, the City Government has transferred the sports complex from the 8 hectare complex in Brgy. Libertad to the 38 hectare complex in Brgy. Tiniwisan/Ampayon. The said complex is worth P250 Million for Phase I will be one of the biggest international standard complex in the Philippines. Phase I consists of a 4,000 seater football main bleacher, a 4,000 seater basketball gymnasium, grass football field, and a rubberized track oval. The Phase I of the Polysports Complex was officially opened in 2015. Phase II will consist of a 2nd main bleacher, an Olympic-size swimming pool, and a baseball/softball field with bleachers. Edelmiro A. Amante, Sr.: Former Executive Secretary of Pres. Fidel V. Ramos. Former Congressman and Governor of Agusan del Norte Second District. Susan Fuentes: The Queen of Visayan Songs (1954–2013). She popularized the songs like Matud Nila, Usahay, Miss Kita Kung Christmas and Rosas Pandan. Susan Calo-Medina: Host of Travel Time (ABS-CBN News Channel) and Tipong Pinoy, a culturally-oriented show aired by GMA Network in 1998. Laurice Guillen: Award-winning film director and actress, also the wife of the actor Johnny Delgado (deceased). Josette Campo-Atayde: Known as Sylvia Sanchez. She is an actress of ABS-CBN. Originally, she is from Nasipit, Agusan del Norte. Dante Javelosa Luzon: Veteran anchor and broadcaster. He was the former anchor of TV Patrol Cebu (now TV Patrol Central Visayas), TV Patrol Southern Mindanao, News Central Davao (Studio 23 Davao) and TV Patrol Dumaguete. Presently, he is now with DYRC. Seth Go Khe: Member/Player of the Pilipinas Aguilas—National Tackle Football Team. Ardy Larong: Small Forward/Shooting Guard of Alaska Aces in the Philippine Basketball Association (PBA). Marky Cielo: Actor of GMA Network. He died so young at the age of 20 on December 7, 2008 in Antipolo City, Rizal. The cause of his death is still unknown. Charito Booc Plaza: She was known as the "Mother of Caraga Region" since she was the author of the bill creating Caraga as the seventeenth region of the Philippines. She was also the former congresswoman of the First District of Butuan City. And she is currently the Brigadier General of the Armed Forces of the Philippines Reserve Force. She is also the wife of the former city mayor Figurado Plaza, Sr.
Stephany Stefanowitz: She represented Butuan in the Miss Philippines Earth 2010. In 2012, she joined Miss Philippines Earth and won the title as Miss Philippines Earth 2012 but she represented Quezon City. She grabbed the title as 1st runner-up in the Miss Earth 2012 pageant held in the country. Her mother is from Barangay Ampayon, Butuan City and her father is from Hamburg, Germany. Lt. Gen. Hernando DCA Iriberri: The former Chief of Staff of the Armed Forces of the Philippines from 2015 to 2016. He is not from Butuan City but an alumnus of Fr. Saturnino Urios University High School department. Jason James Dy: The grand champion of the Voice of the Philippines Season 2. Roy Señeres: Presidential candidate of 2016 National and Local elections. He was the representative of the OFW Club Partylist from 2013 to 2016. He was also the ambassador to the United Arab Emirates during Fidel Ramos administration. The Archbishop Carmelo D.F. Morelos Campus of Father Saturnino Urios University. This campus houses its Preschool, Grade School and High School. ^ "House Bill No. 974" (PDF). House of Representatives of the Philippines. 15 November 2016. Archived from the original (PDF) on 11 October 2018. Retrieved 19 April 2019. ^ "CESB CONCLUDES FIRST PAGLAUM WORKSHOP IN MINDANAO". Career Executive Service Board. 20 June 2012. Archived from the original on 19 April 2019. Retrieved 19 April 2019. The Career Executive Service Board, in partnership with the Association of CARAGA Executives (ACE), brought the Project Paglaum to Butuan City, the home of the Balangays. ^ "JrNBA starts nationwide sweep with basketball clinic in Butuan". Manila Standard. 7 February 2016. Archived from the original on 19 April 2019. Retrieved 19 April 2019. Butuan came to national prominence during the late 1940s to the 1970s as the “Timber City of the South” because of its booming logging industry. ^ a b c "Brgy". Butuan.gov.ph. Archived from the original on 2014-01-10. Retrieved 2014-01-02. ^ "Province: Agusan del Norte". PSGC Interactive. Quezon City, Philippines: Philippine Statistics Authority. Retrieved 12 November 2016. ^ a b c Census of Population (2015). "Caraga". Total Population by Province, City, Municipality and Barangay. PSA. Retrieved 20 June 2016. ^ UNESCO World Heritage Centre. "Butuan Archeological Sites". UNESCO World Heritage Centre. Retrieved 2014-01-02. ^ "Timeline of history". Archived from the original on 2009-11-23. Retrieved 2009-10-09. ^ "A general act for the organization of municipal governments in the Philippine Islands". LawPH.com. Archived from the original on 2012-07-10. Retrieved 2011-04-09. ^ Kent Holmes, Wendell Fertig and His Guerrilla Forces in the Philippines: Fighting the Japanese Occupation, 1942-1945 (Jefferson, N.C.: McFarland & Co., 2015), p. 112. ^ "R.A. No. 522, Butuan City Charter". LawPH.com. Archived from the original on 2012-07-12. Retrieved 2011-04-09. ^ "Butuan, Agusan del Norte Climatological Normal Values". Philippine Atmospheric, Geophysical and Astronomical Services Administration. Archived from the original on 8 October 2018. Retrieved 8 October 2018. ^ "Butuan, Agusan del Norte Climatological Extremes". Philippine Atmospheric, Geophysical and Astronomical Services Administration. Archived from the original on 8 October 2018. Retrieved 8 October 2018. ^ Butuan City District and Barangays "Butuan City District and Barangays"
^ Census of Population and Housing (2010). "Caraga". Total Population by Province, City, Municipality and Barangay. NSO. Retrieved 29 June 2016. ^ Censuses of Population (1903–2007). "Caraga". Table 1. Population Enumerated in Various Censuses by Province/Highly Urbanized City: 1903 to 2007. NSO. 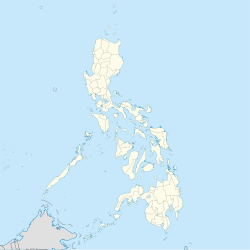 ^ "Province of Agusan del Norte". Municipality Population Data. Local Water Utilities Administration Research Division. Retrieved 17 December 2016. ^ "Magsaysay Bridge". Archived from the original on 2014-04-07. Wikimedia Commons has media related to Butuan City. Wikivoyage has a travel guide for Butuan. This page was last edited on 19 April 2019, at 14:47 (UTC).